the wakes tossed her about but wanted access to board and unload. line and had a mooring ready each time I returned to my camp. 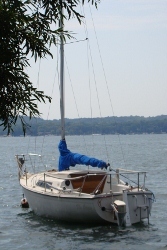 where stern is near enough to shore to allow confortable loading and unloading. /butterfly knot and connect carribeaner/pulley. through the pulley on the anchor line. This line will move boat on and off shore. Well, it takes a thinking sailor to come up with that! lol I think your idea is great and I am going to download it. 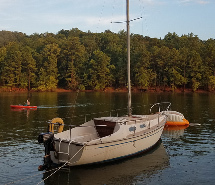 From personal experience and from reading articles about anchoring methods, many look at it as "the dirty but necessary" job at the end of a good day of sailing. 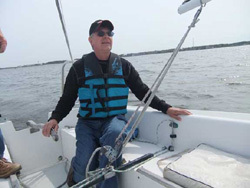 Running a boat into a slip or throwing it on the trailer-end of day - robs many of being savvy to the anchoring part of sailing. Good article and good explanation - THANKS!! !